The military media office of the self-styled army in eastern Libya, which is under the command of Khalifa Haftar, has announced that the forces have started advancing on western Libyan cities and districts in order to "purge the remaining terrorist groups in the region." 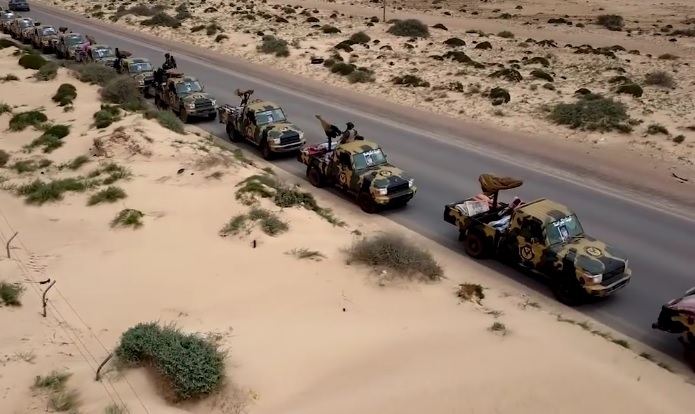 The media office published a video on Wednesday showing a convoy of armored vehicles and pickup trucks mounted with heavy guns on the road, which appeared to be Benghazi's coastline. This bold step by Haftar comes in a form of a political card he wants to use before the holding of the Libyan National Conference (Multaqa Al-Watani) which will be held in Ghadames in mid-April under the auspices of the UNSMIL. Sources from western Libya say that the region is mobilizing its forces and that Sabratha has joined the forces under the command of the western military zone, which is headed by Osama Juwaili, after social mediation. As reckless as this advance by Haftar's forces may seem, sources say that he has high hopes that Tarhouna and Bani Walid would join his forces in the fighting in western Libya, yet other reliable sources from the two areas say they won't be on Haftar's side. According to many observers, the advance on Tripoli or any part of the western region is going to be self-harming to Haftar as his forces would have no alliances in the region and would be so far away from any backup or supply routes. Meanwhile, mayor of the mountain city of Gharyan Yousef Badiri sent an urgent letter to the Presidential Council warning about a military convoy from eastern Libya armed groups approaching his city. He demanded the Presidential Council to take urgent steps to stop the military convoy, which he said aims to attack Tripoli. It's worth mentioning that Haftar's orders to advance on western Libya, especially on Tripoli, come less than a month after he met with the Head of the Presidential Council Fayez Al-Sarraj in the UAE, where they both agreed on ending military operations and committing to peaceful ending of transitional phases and going to elections and unity of institutions.